I’ve told you about my Peace Corps daughter Becca and her efforts to get dance education back up and running on the one Caribbean island most devastated by Hurricane Maria. Rebecca Warthen was on a year-long assignment with the Peace Corps in Dominica last fall when a storm started brewing. A former dancer with North Carolina Dance Theatre (now Charlotte Ballet) and Columbia City Ballet, she’d been sent to the Caribbean island nation to teach ballet at the Dominica Institute of the Arts and in outreach classes at public schools. But nine and a half months into her assignment, a tropical storm grew into what would become Hurricane Maria—the worst national disaster in Dominica’s history. Some of her students at a makeshift barre. The Peace Corps sent her home to South Carolina for two months while they assessed the situation. When the Peace Corps asked her to return in December, she instantly agreed, even if that meant living without electricity. “Some people probably thought I was crazy for wanting to return to a place that people were still evacuating from,” she says, “but I was just excited to round up my students and start teaching again.” So excited, in fact, that she extended her service until January 2019. Unfortunately, Dominica School of the Arts’ dance studio—the only one on the island—was completely destroyed. 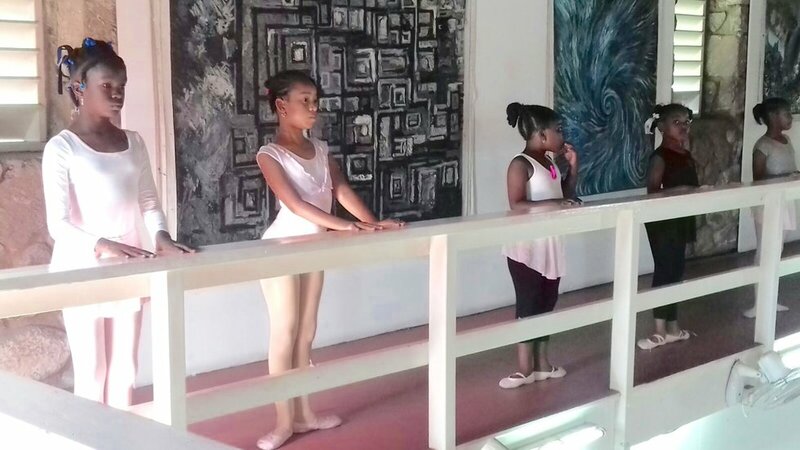 The dancers are now taking class in an art gallery while Warthen raises money through a Peace Corps Partnership Program grant to help rebuild the studio. Fortunately, she just found out that her $8000 fundraiser to repair the floor and mirrors is now fully funded. Meanwhile, Warthen’s found that her work in Dominica has not only been a way to empower her students and help them process this traumatic experience, bot it’s also reignited her own love of dance. Note that her project is now fully funded. Thanks to those of y’all who contributed! Here’s Becca dancing in the studio back before the storm. This entry was posted in Arts, Personal on May 24, 2018 by Brad Warthen. You have good reason to be very proud of her! Thanks for sharing this article. Your daughter’s work is inspiring. That is really terrific work, a great story about the power of art to help kids rediscover joy after such a disaster. Some of that good news that still exists in the world even as we mostly only hear about the bad news. Thanks for sharing that with us!